*Based on laboratory testing. Results may vary. Battery power consumption depends on factors such as network configuration, wireless service provider, signal strength, operating temperature, features selected, vibrate mode, backlight settings, browser use, frequency of calls, and voice, data, and applications' usage patterns. 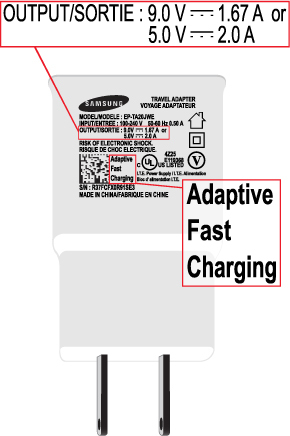 Important: Adaptive Fast Charging is designed specifically to work with the charger that came with your device or the Adaptive Fast Charging Vehicle Charger, which can be purchased from SamsungCanadaParts.com. The Samsung Wireless Charging Pad and Samsung Wireless Charging Pad mini do not support Adaptive Fast Charging. Note: Adaptive Fast Charging works only with the charger that came with your Samsung Galaxy S6 edge+ or the Adaptive Fast Charging Charger. 3. To ensure your device is fast charging, open the Notification Panel by swiping from the top of the screen to the bottom, and look for the Fast charging notification. 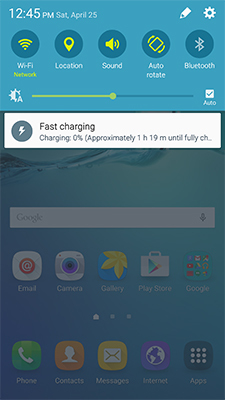 A Fast charging message will also display when your device is turned off during fast charging. • The front of the charger displays Adaptive Fast Charging. • The back of the charger also displays Adaptive Fast Charging. ✔ Turn off your device while it is charging. ✔ Verify that you are using the Samsung USB/charging cable and Adaptive Fast Charger included with your device, not third-party accessories. ✔ Ensure the USB/charging cable is connected securely and is not being blocked by a cover or case. ✔ Check whether a battery or charging indicator appears on the device's display when the USB/charging cable is plugged in. ✔ Charge using a wall outlet, not a computer. 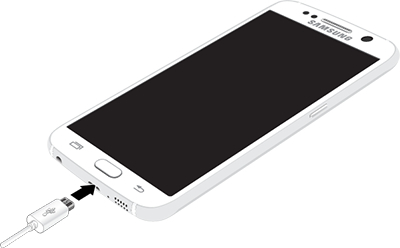 ✔ When the battery is fully charged, disconnect the device from the USB/charging cable.